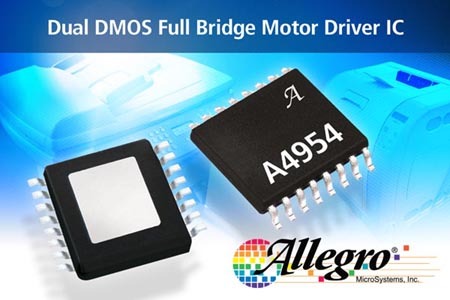 Allegro MicroSystems, inc. announces a new dual DMOS full bridge motor driver IC targeted at the office automation and consumer and industrial markets. Designed for pulse width modulated (PWM) control of two DC motors, the A4954 is capable of peak output currents to ±2 A and operating voltages to 40 V. Integrated charge pump capacitors reduce external component cost and count. Input terminals are provided for use in controlling the speed and direction of a DC motor with externally applied PWM control signals. Internal synchronous rectification control circuitry is provided to lower power dissipation during PWM operation. Internal circuit protection includes overcurrent protection, motor lead short to ground or supply, thermal shutdown with hysteresis, undervoltage monitoring of VBB, and crossovercurrent protection. The A4954ELPTR-T is provided in a low-profile 16-pin TSSOP package with exposed thermal pad (suffix LP) that is lead (Pb) free, with 100% matte tin leadframe plating.